\"Sale dei Primitivi\" have been reopened with 14 new artworks! Nine months after their closure, the rooms 2-7 have reopened. They are called, in Italian, “dei Primitivi” (rooms of the Primitive). They were closed in order to improve the lighting and the air conditioning – fundamental for the health of the ancient artworks displayed in these rooms. These rooms have been obtained from the Teatro Mediceo (the Medici theatre) – during the Fifties – by the architects Michelucci, Scarpa and Gardella. Now the halls have sophisticated systems and a new lighting that mixes natural and artificial sources. The renovations are part of the New Uffizi project and they not only give us the renovated rooms, but also 14 new artworks, that come from different storages. These rooms are the first in the Gallery itinerary: here there are the three Maestà, by Cimabue, Giotto and Duccio, that – like the Coronation of the Virgin, the triptych by Lorenzo Monaco – were protected in special “climaboxes”. 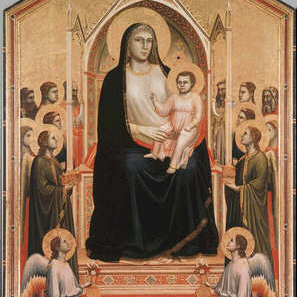 Other paintings have come back on display: works by Simone Martini, the Lorenzetti and the Gaddi brothers, Giovanni da Milano and Gentile da Fabriano. A series of masterpieces that represent the beginnings of great Italian art, because they are from the Late Medieval Age and the Early Renaissance. In the new set-up walls are white, and the works are displayed in order to highlight the most important. The 14 new paintings – among others Majesty and angels by the Master of Santa Cecilia, a Crucifix by Pacino di Bonaguida, the Blessing Redeemer by Spinello Aretino and a portable tryptic with a Virgin, a Crucifix and Saints, by Pagino di Bonaguida – are placed in the rooms, according to the selection made by the director of the Gallery Antonio Natali and the director of the Dipartimento pittura del Medioevo e primo Rinascimento, Daniela Parenti. By this way, the First Corridor comes back to his splendor, rather in a new version, to let visitors discover the origins of Italian art. This is another – very important – step towards to the New Uffizi fulfillment!